Danny Cipriani missed a drop-goal with the last kick of the game as Harlequins edged out Sale 16-14 at The Stoop on Friday night. Bath opened the scoring on 12 minutes through Dan Braid, Cipriani converting, before Nick Evans cut the gap with a penalty to make it 7-3 shortly before half time. But Quins blew the game open after the restart, Evans with a second three-pointer before Tim Visser got in out wide, Evans with the extras on top of a further penalty that made it 16-7 to the hosts on 54 minutes. A tense period followed, and Sharks were next to go in as Sam James’ try, converted by Cipriani, made it 16-14 with the final ten minutes approaching. But, despite a brave fightback in the closing stages, Cipriani’s usually trusty boot proved wayward in the dying embers of the game as Quins held on, but Sale took home a hard-earned bonus point. In a game that unfolded as a tight encounter but was far from a classic, it was the Sharks who enjoyed a dominant first period, carving up the metres thanks to a stellar effort from their forward pack and they took a deserved lead as the second quarter approached. With Cipriani pulling the strings, it was no surprise to see the England fly-half set up the game’s first try, forcing Visser to fumble under a high bomb that Sharks captain Braid pounced on before scrapping his way over from five metres out. Cipriani knocked over the simple conversion but went wide with his next attempt on goal as he slipped when preparing to launch a penalty. And seven points was all the visitors could yield from their dominant start as Quins struck to within four points shortly before halftime with Evans hitting a penalty goal after a searing catch-and-drive play from the hosts. He could have kicked his side to within a point just minutes later, but another penalty attempt drifted just wide. After a frustrating first period, Quins came out in determined mood after the break and Evans, fresh from scoring a Premiership record eight penalties in his side’s 38-28 win at Bath last weekend, made it 6-7 with a simple penalty soon after the restart. And the hosts went ahead for the first time five minutes later. A massive multi-phase play built pressure on the visitors’ line and Evans saw Visser in space out wide before unleashing a perfectly-weighted kick, and the winger showed immense composure to gather the cross-field kick and dot down in the corner. Evans nailed the touchline conversion before extending their advantage in the 54th minute – taking advantage of another scrum penalty to put his team nine points ahead. But the away side rumbled back into contention ten minutes later as James forced his way in following a slick switch ball from Cipriani. Cipriani’s conversion put his team just two points adrift of the hosts but the England fly-half missed a penalty eight minutes from time before he pushed a drop goal attempt wide of the left post with the final kick of the game, leaving Sale to reflect on another winless away trip, their last success on the road coming in November last year. 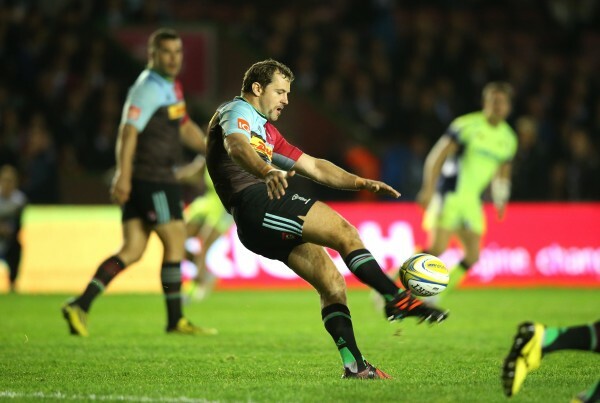 during the Aviva Premiership match between Harlequins and Sale Sharks at Twickenham Stoop on November 6, 2015 in London, England. With Sale well on top, the New Zealander kept his composure to guide Harlequins back into the game either side of the break, before his in-play touches of class and a near-faultless kicking game handed his side a crucial advantage.